Today I’m pleased to be bringing you the latest stop on the Great Escapes Virtual Book Tour for Vangie Vale & the Murdered Macaron by R.L. Syme. This was a delightful book to read and I enjoyed it. Stay tuned for an interview with the author after the review. ** Update 8/7/17 ** Yesterday I still didn’t feel well, so updates to the post had to wait until today, but I’m happy to report that we now have more formatting, purchase links, a link to the item on Goodreads, and links to the author’s sites, plus graphics to help break up the text. Thank you for being patient as I dealt with my migraine and the aftermath. Small towns and gossip go together like flaky crust and sweet pastry cream. Between the police scanners, social media, and the senior center, it’s like a zombie apocalypse where they consume people’s secrets instead of living flesh. But Vangie Vale wants nothing more than to stay under the radar…especially the police radar. Forced back into the role of investigator, this newly-arrived-in-town part-time bakery owner has to become the very thing she hates–a nosy, small-town gossip–in order to clear her good name, and keep her face off the front page. But when a date-gone-wrong brings her face-to-face with the Sheriff, Vangie can’t ignore the fact that one of her macarons was involved in a murder. She has to find out who-dun-it. As I said above, the book was a delightful read and I enjoyed it. I like our main character, Vangie. Sometimes she drove me a little nuts because she had a tendency to put herself into situations that held the possibility of danger without really thinking too much, but she didn’t do that often, so I didn’t get too annoyed by it. I had mixed feelings about most of the supporting characters throughout the book. As we got more into the back story of the town and its people, I understood the characters motivations better and started to like some of them more, but there were enough red herrings in this book that I was suspicious of most of the townspeople and characters until the villain was actually revealed. The plot line moved along at a steady and somewhat quick pace, though it wasn’t so quick that you couldn’t keep up. This was a fun read and I recommend it to anyone looking for a good whodunit. First, let me say a huge thank you to R.L. Syme for being willing to answer my questions. I don’t. I’m lucky enough to be able to write full-time. I love it. I used to have non-writing jobs, though, and I’ve done so many different jobs, mostly in the nonprofit arena. Theater, music, church, youth, restaurants… all great experiences for me to take from in the writing. I write every day. Pretty much during the same hours every day, too, unless I’m on deadline, and then I’ll probably write more. I usually try to write a specific number of hours, rather than a word count. That way I know I’ll always get it done. 3) When you’re writing, do your characters seem to “hijack” the story or do you feel like you have the “reigns” of the story? Similarly, do you outline your book first or just sit down and write, seeing where it takes you? With Vangie, I definitely feel like the story was hers, and she took over. It might be because I feel like I know her so well, I can predict what she does. I love knowing a character that well. I definitely went through a lot of rejections first. I never thought about quitting before…I’ve thought about quitting after. Lol. It’s definitely hard work. But I love it. To keep myself hopeful, I try to focus on the characters and the story I’m telling. I want to see them get their justice or their happy ending. Macaron went through three pretty major revisions. Normally, I don’t do that many, but this book has a lot of moving parts. I have two editors and several beta readers, and they are so helpful. I definitely set the book aside after every draft or every read-through. I like it to be fresh when I look at it. The thing I love about mystery is that the villain is usually someone who has a really good reason for doing what they did. They just got desperate. I think that’s what I like so much. I get to sort of write normal people who just get carried away because they want something so much. I think that’s what makes mystery so interesting. My characters are definitely fictional. I try to make them as real as I can, so I almost always have pieces of something familiar in them, but I never write a one-to-one correlation of a person. I don’t think it’s fair to try to tell someone’s story so completely like that. But I also want them to feel real. That’s a great question. I’ve always wanted to do non-fiction, about TS Eliot. In fact, I worked on a fiction book about TS Eliot for a long time, but it never quite came to fruition. But there’s always a chance I will go back to that idea someday. I love TS Eliot. I’m just finishing a re-read of Tana French’s The Likeness, and I’m really enjoying it. I’ve read all of her Dublin Murder Squad books, and I think they’re my favorite series out right now. I’d be lying if I didn’t say The Bible, just because of my religious background. But in addition to that, I’ve been reading thriller and mystery for so long, I’d have a big list of those, as well. Nancy Drew would be up there, and Dean Koontz. John Grisham. But then, additionally, I was an English major, so I’ve read all the classics, and those have influenced me a lot, as well. Poetry, too. Eliot and Hopkins most notably. I usually don’t respond to reviews. I did once, on one of my very first books, and I learned from the experience that it’s not my job to tell readers what they did and didn’t experience during my books. I’ve learned that I have to be really okay with putting the book out into the world and letting people think what they’re going to think. Not everyone will like every book, and reviews are supposed to help readers find the books they will and won’t like. As a good friend says, reviews are for readers, not for authors. If you wish to follow the rest of the blog tour, click on the banner below and it will take you to the main tour page with the schedule of blogs! Vanilla Beaned by Jenn McKinlay is the eighth installment in the Cupcake Bakery Mystery series. Welcome to another fun, wonderful story about our bakers, Mel, Angie, and Tate and the troubles they always seem to find themselves in! This installment is filled with romance, intrigue, crime, cupcakes, and an adorable 5-year-old who is an expert in all things cupcake. Add in an Elvis impersonator competition, Mel’s employees, Oz & Marty, plus, the handsome police detective, Manny, and you’ve got one crazy, hectic, but thrilling and enjoyable book on your hands. Our bakery owners find themselves in Las Vegas as they look to start their first franchise, owned by Holly, who is an entirely self-taught, but phenomenal baker. However, as they usually do, the situation goes awry when the first storefront being considered for the location blows up. 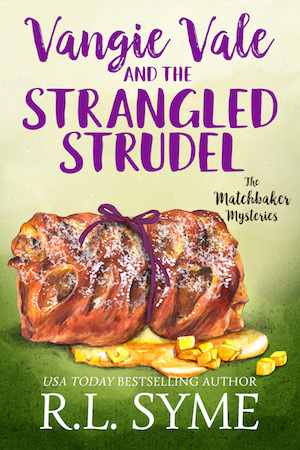 While the quartet (Mel, Angie, Tate, & our new baker, Holly) try to figure out who is behind the mischief, Melanie finds herself entranced by the baker and her 5-year-old daughter. She decides that maybe franchising isn’t such a bad idea after all. The story line in this book was wonderful. I did have an inkling of who the culprit was, but only because of something our adorable cupcake expert tells us. One of those details in the story where if you miss it, you’ll probably have no idea until the end who the culprit is, but if you catch on to it, it’s a pretty good clue. Having a change in setting was great as well. Las Vegas is always a happening town. While the casinos and their shows, gaming floors, extravagant hotels, etc. were featured, you also saw the other parts of Las Vegas, the parts off “The Strip” that you don’t always see in books and movies. The only criticism I have is that if you’re a long time reader of this series, you know that the seventh book ends on quite the cliff-hanger. While it’s resolved at the beginning of Chapter 2, it was a little startling to me going from that cliff-hanger to nothing special happening at the very beginning of the book. It’s not a huge deal, but it bugged me. All in all, it was a thoroughly enjoyable book in the Cupcake Bakery series, one of my favorites in the series, actually. If you like cozy mysteries, give this one a try! Then gobble up the rest of the books in the series too!